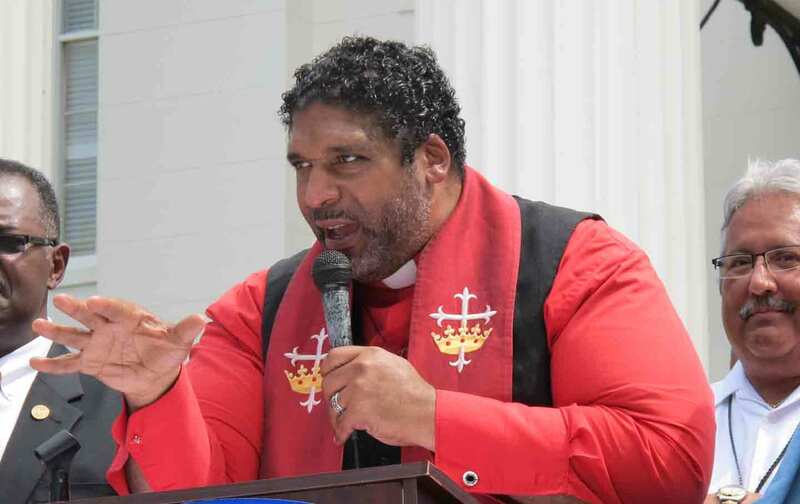 Our moral movement is spreading out from North Carolina, one powerful gathering at a time. When I was growing up in eastern North Carolina, I used to love to sit in my grandmama’s kitchen and listen to her sing as she made dinner. Whenever she was done cooking, she’d give me a plate to eat. Then she and some of the other sisters from the church would make up some to-go plates and, with their aprons still on, they’d head out the door to visit the sick and shut-in. “We going to hope somebody,” Grandmama would say. For years, I thought Grandmama’s grammar was bad. I studied my lessons in English class and knew that “hope” wasn’t a verb. I didn’t dare correct Grandmama, but I knew better than to say I was going to hope somebody. God sent an angel to hope me, and something powerful happened: Folks started getting together. My doctors got together with the nurses and my family got together with my therapists. My church got together and figured out how to help me get around. It was a dozen years before I could walk on my own, but the minute I had hope down on the inside and folks started coming together, I knew I had a future. Since April 4, I have been traveling the country with the Moral Revival. In each city we’ve visited, we’ve gathered clergy, labor, and civil-rights leaders for moral political leadership training. Using the blueprint of North Carolina’s Moral Movement, which I lay out in my book The Third Reconstruction, we’ve been hoping people who’d begun to wonder whether hope is possible in our time. This training is about more than inspiration; it’s an invitation to come together across historic dividing lines to build fusion coalitions around a moral agenda. When people get hope and come together, revival happens. We saw it in Birmingham, where some preachers and union organizers had been trained in a synagogue just a few weeks before. They reached out and packed a historically black Baptist church on a Monday evening with a crowd as diverse as the city itself. We saw the same in Cleveland, where over 1,200 ministers had already signed our Higher Ground Moral Declaration by the time we got to town. We tried to deliver a copy of the declaration to the Republican National Convention leadership, but they turned us away. When we paused to pray for this nation and its leadership, they threatened to arrest us. But that didn’t quell the revival. Folks in Cleveland had already been hoped. Without a revival to hope America, many who live with their backs against the wall will succumb to despair. But when we get together like we did, again, in Boston this week, and I look out and see black, white, and brown; rich and poor; gay and straight, documented and undocumented coming together around a moral agenda for the common good, I know God is reviving the heart of democracy in this country. And I know why Grandmama always smiled the way she did when she said she was going to hope somebody. Because as much as it’s doing to build new coalitions and to encourage moral-fusion organizing around the country, this Moral Revival is hoping me. Please help us spread the word about our next Moral Revival service in Washington, DC, on August 28, 2016.